Humberto Sandoval, Actor, 1991. Gelatin silver print, 1/6. ©1991. 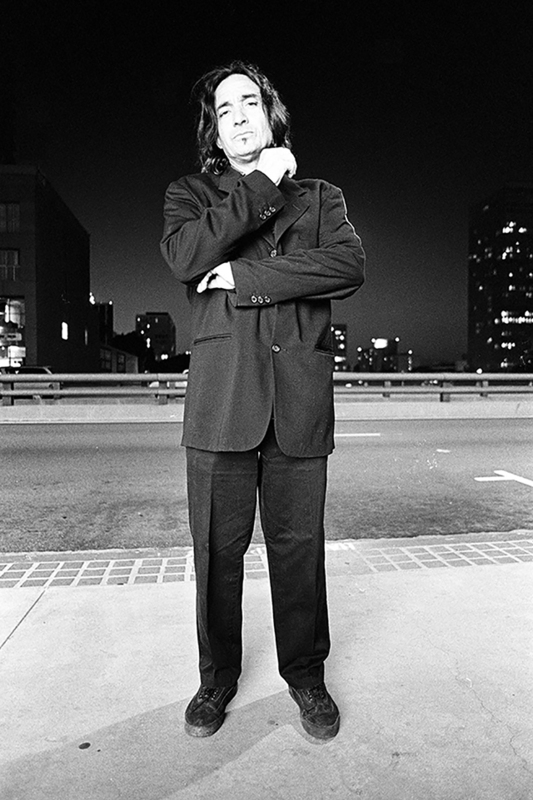 This was the first photograph of the Chicano Male Unbonded series. Sandoval was also a member of Chicano art group Asco. 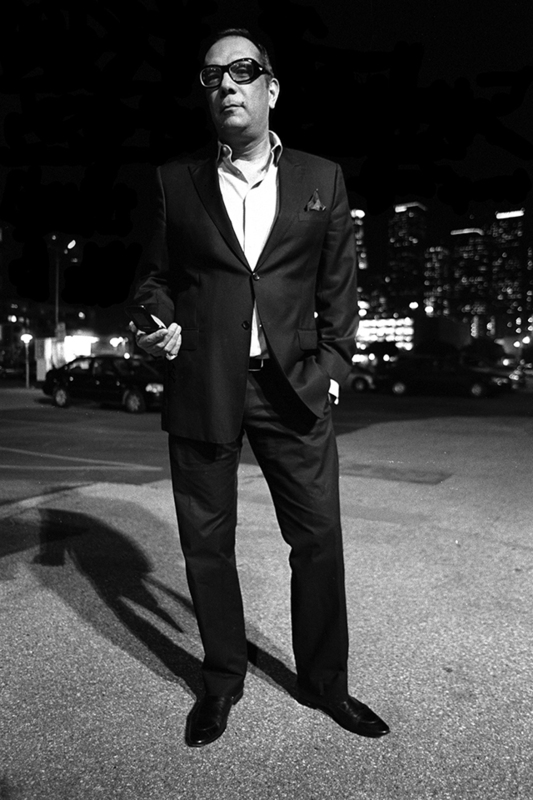 Photo by Harry Gamboa Jr.
William Moreno, Impresario, 2010. Gelatin silver print, 4/6. ©2010. Photo by Harry Gamboa Jr.
Francesco X. Siqueiros, Master Printer/Artist, 2001. Gelatin silver print, 6/6. ©2001. Photo by Harry Gamboa Jr.
See What You Mean: Hopscotch at The J. Paul Getty Museum. ©2017. Photo by Harry Gamboa Jr.
Gamboa, a photographer, essayist, performance artist and lecturer of Chicana/o Studies at California State University, Northridge, still reflects on that moment. “I immediately thought, ‘Wow … this kind of broadcast puts all the Chicano males I know in danger — my father, my brothers, my uncles, my son, myself, all my colleagues and my friends,’” he said. The series has garnered international acclaim, most recently from The Autry Museum of the American West, which mounted the first comprehensive exhibition of “Chicano Male Unbonded.” The exhibition is currently running through August 2018. The black-and-white portraits, Gamboa said, call into question the assumptions the media has about men of Mexican descent. The Autry exhibit includes recent work as well as photographs on view for the first time. More than 90 images are featured. 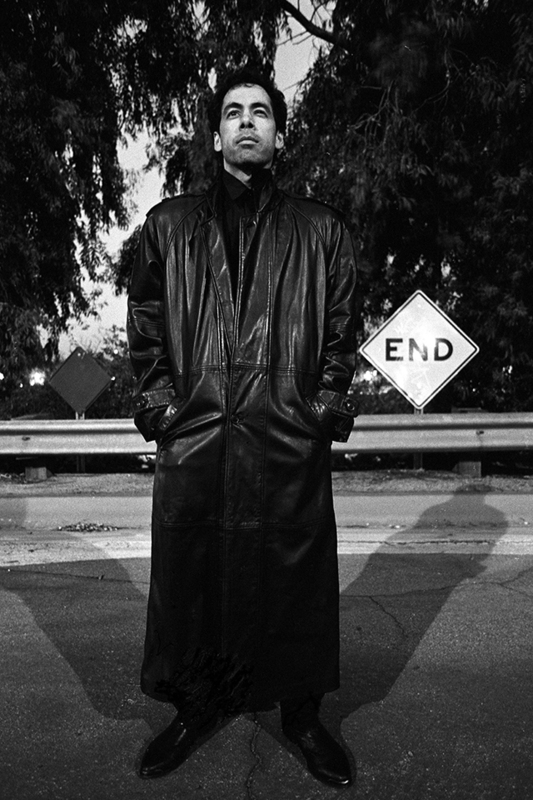 Gamboa used a film noir style in his images, with backdrops “in an urban space to present the Chicano male as they might be encountered on the street,” he said. Gamboa recalled how, in the 1990s and early 2000s, in certain parts of the country where there weren’t large numbers of Chicanos, people would look at the photos and ask him which gang the subject belonged to. “Each photograph is titled [with] the name of the individual, as well as their self-defined occupation,” Gamboa said. “And they are all lawyers, doctors, faculty, artists or writers. The stereotype that Hollywood tells us of the Chicano male is not the Chicano male at all. Gamboa’s series “provides a unique lens for thinking through society’s perceptions of men in the Chicano community,” said Amy Scott, the Autry’s chief curator and Marilyn B. and Calvin B. Gross Curator of Visual Arts. The project dates back to 1991, but Gamboa’s passion for art, photography and social justice predates his initial idea for the series. Gamboa gained international attention as an artist more than 40 years ago as a member of the pioneering Chicano art group, Asco (Spanish for nausea). Though the initial reaction to his work with Asco was resistant and political, art collectors, museum curators and academics hailed Asco and Gamboa for presenting the realities of a community that was long ignored and provocatively translating the universality of its experiences. For more information about the Autry exhibit, visit the Autry’s website. Gamboa’s most recent work is a photo-stories series called “See What You Mean: Fotonovelas,” for which he served as the Getty Artists Program 2017 resident. For more information about this event, visit the Getty Museum website.